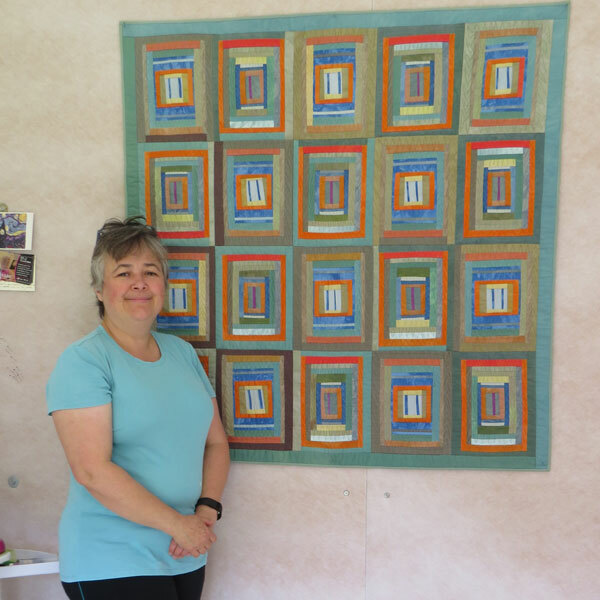 Ana talks about her first freehand cut quilt, where you do not measure the fabric, made using hand dyed fabric. She explains a lot about dyeing techniques and how she has learnt dyeing, as well as teachers who have inspired her. Later Ana gives her views on exhibiting work and explains why she doesn’t exhibit. 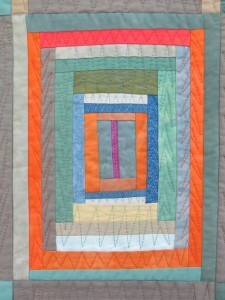 Jacquie Barwell [JB]: [Interview introductions] So, Ana, could you start by describing this quilt a little bit for us? Tell me something about the colours and the design and perhaps why you made it. Ana Tims [AT]: This is my first, it’s a very important quilt for me because it is the first quilt I cut freehand. I mean, people look at it and think have you used a ruler? No, I cut it freehand. But I was so, so stressed. It looks like I used a ruler, but I didn’t. But, my, the way I worked in my head to be able to do it. I would make all the blocks, and then I would measure the smallest, the biggest, I would put a border and they all would fit. And that’s exactly what happened. It’s not a big quilt. It’s 44 ½ by 45 ¼. I don’t think you could design that if you tried [laughs]. And the plan was to use all my hand dyes, or some of my hand dyes and I was trying to put different colours with it. I know it doesn’t look like ‘cos it’s mostly greens and aquas and some blue but there are quite a few colours in it and every time I did a round I would add a different colour and there’s a, I learnt a lot about colour with this quilt. Because the colour that is on the outside of the block when you put them on the wall is the most important colour you find because they got, there’s two blocks. The ones with the purple and the grey and I did that number because I had a tiny bit of that purple and I wanted to use so that’s the little sliver of non-direct angle. That one [points]. The, I had, the other block is the one with the two lines of dark blue, royal blue and I just went around. So I started with putting some colours and changing them. And so I learnt a lot about colours. And of course I had to cut freehand. Absolutely. Almost killed me, this thing, [laughter] because I really was in love with my ruler. But I couldn’t do it and when I, it was very liberating because once you learn to cut freehand, and, I don’t know, it’s quite an amazing experience, how much freer it is to work. And then I start working with it and about, I’d say, 2010 because, Nancy… this also result of my studies with Nancy Crow because she allows you. The first time you go there, the first course she allows you to use a ruler. JB: Could you just tell people what, who Nancy Crow is? AT: Nancy Crow, she’s an American quilter and in my book she’s one of the best quilters on the planet. She’s a trained artist, she’s a classically trained artist who use fabric and quilting as a medium. So she, I like, I personally like her work, I feel it’s very strong and she is, from all the teachers I had, which I great respect for all of them, but she is the best teacher I ever had because she really makes you work very hard. It’s not an easy course to go to. I had people who said to me ‘oh, but she assumes a lot, she asks for a hundred yards of fabric, minimum’. Yes, she does, but, I said ‘if you’re not prepared to do it maybe you should take up watercolour’ [laugh] because you do need all those colours and she makes you think about colour, about and proportion, oh yes, proportion, and form and shape and line. And, it, for me, I have no artistic training whatsoever, and I’m not particularly an artistic person. Some people they draw a line. A beautiful, elegant line. I draw a line and with luck it’s a line, so I have found it very, very difficult, but, I think she is really one of the best teachers there are around. There are other teachers but for me she’s the only best teacher because she was really inspirational she was really a revelation. She’s very kind but she used to have a really bad reputation when she was younger and now she getting a bit older she says she’s mellowing. It’s not that she’s unkind, but she’s very rigorous. That what she said to us last time, ‘I’m rigorous’. We all just burst out laughing, because yes, she will pull no punches, but she doesn’t say something to you without great thought and experience behind and she will look at quilts on the wall from the other side of the room and she just shout at somebody ‘get rid of that piece’ so we all look there and see what’s going wrong and I don’t want to make the same mistake but there’s this tiny piece of whatever and we are thinking ‘how did she see that?’ The woman has an amazing eye. She’s amazing, so, that’s Nancy and I knew that I did Part 1 and I knew that if I wanted to get on I needed to get rid of the ruler. So this was my first effort. JB: Right, moving on. I believe you’ve also done classes in this country? AT: Oh, yes as well. Oh, gosh, yes. 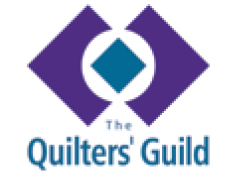 I started my quilting career doing a class in a shop in Worthing, was the Quilt Room? And they were traditional. You had to do your templates, you had your sandpaper to trace everything on the fabric. You had to sew everything by hand. They really disliked this machine piecing malarky. I don’t think rotary cutters existed, but they were very new, so we were doing the templates, cutting, tracing, cut everything with scissors and you were allowed to use the sewing machine to sew your border after you measured and everything. But I really enjoyed it, that took me another god knows how many years to go back to it, but I really enjoyed doing that because I think it seen. Fast forward into today I see a lot of people who, they don’t learn these techniques and they, they lack that, because that helps you. With the rotary cutter, even the freehand that I do now, I still sometimes think back, to the process to see what I’m doing. So I thought for me it was a very good experience to how, from that. So we did this sampler quilt. And I was brilliant at piecing and everything I was ahead of the class every week my work was on time. And then we finished the quilt. It had to be quilted. I hand quilted it. Ten years on later I finished the quilting and it is on my daughter’s bed. But I didn’t, that’s how I started, then I did a City and Guilds in embroidery, I forgot about quilting, but funny enough my last piece of City and Guilds you could describe it as a quilt because I embroidered the squares and used insertion stitch, so whatever, hangs as panel, but reads a lot like a quilt. It’s quite an interesting thing. And then I, after finishing City and Guilds everybody feels a bit burnt out because it’s quite intense and I start doing quilting. And then I did, I bought a lot of quilts, a lot of kits or books and I think I taught myself a lot after that. Then I did all kinds of little courses, like courses that you go to a particular quilt and then in about 2008 I think, oh 2008 or 2007 I went to Birmingham for one of those Virtual Studio classes with Claire and Leslie. AT: And the reason I wanted to do this. JB: That’s Clare Benn and Leslie Morgan? AT: Yes, from Committed to Cloth. The reason I wanted to do that because doing my City & Guilds we were taught to dye. But my dye was a complete utter disaster. Because the teacher, she knew how to dye but she wasn’t knowledgeable enough really. This was my experience now. At the time I thought she was brilliant, but now I know she didn’t know much to explain certain things and then I tried to do it at home. And there was a lady who came over and she was an assertiveness teacher and she knew how to dye. So she turned up home, she got God knows how many spoons of Procion, put in a jug, boiled in a kettle, mix it up. Well that’s a recipe for disaster. I was expecting these beautiful, wonderful jewel colours coming out of this bucket and all I got was pastels [laughs]. AT: It’s a bad expression but Procion reacts in hot water. It will react with the water so you kill your dye. We use the expression ‘kill the dye’ which is not a good expression, but is a good one to explain. You kill your dye if you put boiling water, it’s like lukewarm at the best of times which blue always needs more, but it’s lukewarm or whatever. So I really wanted to learn to dye because everybody was dyeing, there was me, you know, something’s wrong here. So I went along to dye with Clare and Lesley and I did what they call a course called ‘Wet and Wild’ which is, you learn all the wet processes; tie dye, clamps, you screen print, you do paste, everything. Which was brilliant, but being me, slightly control freak, I wanted more control of my result because I did, I did an experiment just in mixing dye colours. So I made, mixed the primaries and I did this experiment where I put drops, like one drop of blue with one of yellow, whatever, then I painted little squares, and one drop of blue, two drops of yellow, to see where the colours go. AT: It’s all very well, I did that with just dye on paper. It’s all very well when later on you learn that it’s not what you get in the bucket because the minute you put soda in, which is the fixative, it would change that colour. Its’, never fall in love with the colour in your bucket it just leads to disappointment. It’s a sad relationship. And Lesley and Clare, they’re very much, they are amazing dyers, they get what they want, but they got years of experience. And there is me who just start to dye thinking ‘there must be another way’ and of course I found someone in US called Carol Soderlund, and Carol Soderlund has developed a method that’s unique because the home dyer has as much control in your dye as a dye house. I could mix dyes to sell in powder form to people say ‘look, you want black, I can make black’. I can dye the colour, I can mix the powder. So it is a very, very unique method for the home dyer. And was like a train crash, that’s the only way I can describe it because I’m still learning. Back in 2008 and I’m still learning every time you put things in the bucket you learn and Carol has the answers. And she’s an amazing teacher because it doesn’t matter who you are, wherever you are on the planet if you have a problem, 20 years later after her course you write to her she’ll write back and explain the same thing 20 times. You know. JB: That is amazing to have somebody like that. As a mentor, isn’t it? AT: I mean she’s just amazing. I really, I worship the ground that woman walks on because she knows what she’s doing, she understands the processes. She has developed a new course now which is how to get, er, what we call neutrals, the browns, the greys. I cannot explain, until you do the course you don’t realise how much there is in it, because I just did a really silly mistake last year, with something to do with my mediums, my lights and darks and whatever, because if you get a blue, let’s say you want a really dark navy blue you can have something like 12% of the weight of the fabric in dye, and it’s really dark, you won’t get darker than that, then you just waste the dye down the plug. But yellow is 8%, more than 8% you’re wasting dye but although there’s luck it is experience. That’s what I did I went to Carol in 2008 learnt to dye which was a godsend because in those days you didn’t have beautiful colours in a catalogue with plain fabrics. Because the next thing I did in 2009 I went, I said I wanted to learn from Nancy Crow because I thought I really like her work I want to learn with her. And I read all the books the woman ever wrote and I read that she did 300 quilts. I had made about 3 by that stage to the point that one day she said ‘How many quilts did you do?’ I said ‘Finished?’ She says ‘no, don’t worry, count the unfinished’ ‘Three.’ So it was a slight, I don’t know, things, just damned stupid to go at that stage, but I didn’t know any better. I didn’t have any experience. I wanted to learn. And I, I did learn. So I used everything I knew from Carol to dye the fabric that you need to take to Nancy because she’s very specific what she wants. And, you still, you do the first time and you get it right. I haven’t seen anyone, including Carol, who got right the first time. Carol herself said what she did, she said ‘I didn’t have a clue what the woman talked about’ but she just brought everything she could and being a dyer she took a lot. So somewhere some things were right and that’s how I started and I started learning off Nancy and this quilt is the result of my interest in learning to cut freehand and that’s what I had to do. Of course, nowadays I can cut freehand and there is no, no problem anymore, but at the time, so for me it was a very important quilt at the time and I still like it today. I think I did a reasonable job, it could have been so much more free, but you can’t… it’s where I was at the time. JB: And I think we all have to understand that everything is developing, we’re not at a fixed point but we are all able to learn. AT: Yup, and the other thing I learned no point me going to the quilt festival to some exhibition, look at someone and say ‘oh I’m going to copy that’ so in my head to square that up, we’re all on a road that goes somewhere and you are where you are. You have to walk that road, you have to learn to design, you have to learn to dye, you have to learn the craftsmanship behind your quilts. Because I go to some places and you see quilts which are beautiful and then you look at the quilting and you think ‘hmm, somebody let something down.’ And sometimes it’s the other way round. I mean, well, beautiful quilting, with really naff design. 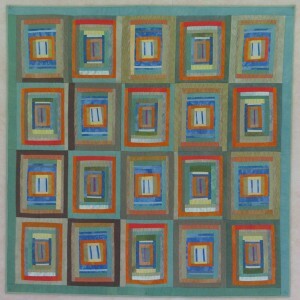 I think quilting, this is what attracts me to quilting; quilting is a discipline. It requires so much knowledge. You. Like anything else, you get out as much as you put in. You can start with your choice of fabric, if you going to hand dye, how much control you want over your hand dyes or if you go to commercial fabrics. It’s craftsmanship that you need to know about sewing. Because that a quarter of an inch is there for a reason and there are people who don’t use quarter of an inch which doesn’t mean they don’t make beautiful quilts, of course they do, and there are plenty of examples out there. But I think it’s when you get what I don’t like to see is sloppy craftsmanship. And it’s when you look at something and you think well, that is not wonky by design or wasn’t an intent it was just a result of bad craftsmanship. It’s almost as some people almost lazy. You know if you have to have a ¼’, if you’re doing something that’s precise make that quarter of an inch, iron that fabric and, I don’t know, I’m very hot on that because I think we need to be proud of the craftsmanship behind it if you want it. But if you want to be a free quilter, people who just put fabrics together, that’s fine. But be true to what you are. But I think there’s a lot of things that you see out there, you know, you don’t want to be the quilt police, you don’t want to be nasty about other people’s work. It’s not about that but sometimes has to meet. It’s a good idea to meet. [JB: Yes] You need to learn, you know there is techniques to do that, and you need to learn. It’s all very well saying ‘oh, I want, I don’t like to pin’. Fine. But don’t expect your work to be precise, it’s not going to work. JB: You’ve been talking about looking at other people’s work in books, in exhibitions. How do you feel about exhibiting your own work? AT: Well, I don’t think I’ve got a body of work that is strong enough to be exhibited. I don’t think I have a voice that is truly mine, because I don’t want to be a clone of Nancy Crow because that’s the person I’m working with. I don’t want to be a clone of Clare Benn or Lesley or whoever. I want my own voice. And I don’t think the body of work I’ve got at the moment is truly mine. It’s coming, slowly. And I don’t want to exhibit quilts that are ‘kits’. There’s nothing wrong if that’s what you do. And I think the quilt Festival at Birmingham is an amazing example of beautiful pieces of work that they are made out of kits or whatever else. But for my journey, for my… I don’t want to do that. Because not everybody is going to want to design their own thing so it’s, for me, if those people want to exhibit and they are beautiful quilts. You know Festival of Quilts are full of them and I think they’re brilliant, but it’s not for me. I will, I will just consider exhibiting when I think I’ve got something that is worth doing and I think it’s not now. JB: I shall be very interested to see when you get to that stage. JB: I think that we all have, we have great feeling for our work. AT: Yes, I think every quilter does. Because at the end of the day you get these two pieces of fabric. And what’s so precious about it? It’s one of the things I have to learn as well is not to be so precious about my work, because you will put something that in your head is brilliant and, god, I did that a few months ago. I spent hours putting things together because I wanted to put a line between two very heavily printed fabrics because I wanted that to divide. Yeah, well, what happened after spend hours sewing this one eighth of an inch line. I have to be proud of it, it was quite perfect one eighth of an inch line and made absolute no difference whatsoever. Disappointment comes, you know, so many shapes. So, you have to stop being precious. I have to say okay, learn from it, you know, there is a recycle bin, move on. AT: That is one of the things I have a lot of difficulty because I think people who you know, they have a scrap bin but each little bit of fabric, it’s so precious, and you think well, move on, you know. You have to. And I think for me that was another important learning curve. Doesn’t mean I waste fabric. I mean, oh, no. I hate, I hate the waste but you never saw any artists complaining about the amount of paper they had to use when they learn to draw. And you don’t see those things, because I know from friends who are artists, who says, I have a particular friend in mind who, she was at the Slate? 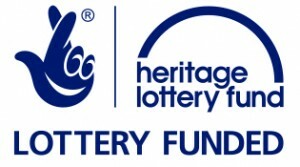 In London? Slate? AT: Slade, sorry and um. So she finish her first term and at the end of the term you have to clean the classroom and the teacher says ‘go and get your mess over there.’ She said ‘That’s not mine’. ‘Oh yeah, that is. Have a look at the name.’ And she couldn’t recognise her own work because it was so bad. But, you know, there’s things. I mean she became a very good watercolourist. An amazing artist. She doesn’t exhibit there. You know. 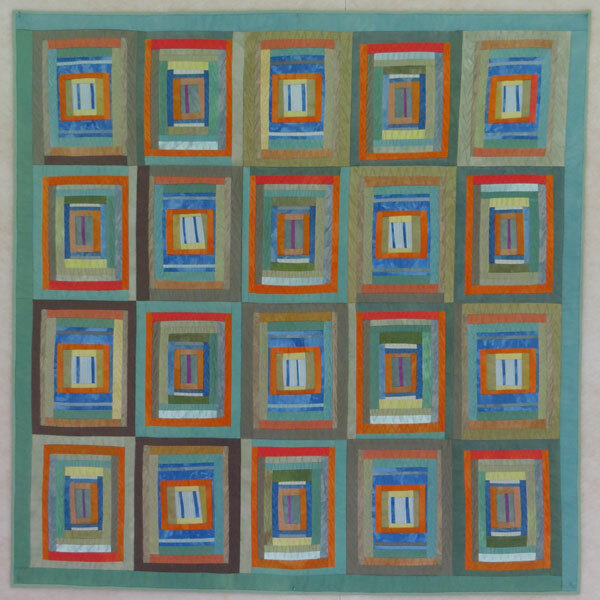 I think with quilters, because we come from a different tradition, a different point. I didn’t go to art school. I didn’t learn that kind of thing. I didn’t earn to draw, or anything, so you have to learn, you still have to learn all the elements of design, you have to learn everything. But, it’s almost a different route. And I think in many ways we make very difficult for ourselves because we are picking up on the one bit here, one bit there and putting it together. And I think this a very difficult process. And of course, every mistake we make, is much more public because you’re not in school, are you? You’re sewing with The Guild or you’re sewing with a friend and whatever. And you think, ‘oh my god what did I have in my head to do it’. And so that’s why, until I have a body of work that I’m really sure about and I feel confident about, um, I don’t want to put anything out there. I mean, my friends see my quilts, that’s different. I don’t even put much things on blogs or Facebook or anything like that, because I don’t think it’s good enough. Maybe I’m too, it’s not being precious about my work, it’s being discerning about what I want to put out there. I don’t know, I think I’m in good company. Agnes Martin ripped all her canvas. I just saw her exhibition. She destroyed all the canvas she didn’t want anybody to see. So, I’m in good company I suppose. JB: I think you are who you are, certainly are. Thank you very much for talking today about your quilts and your quilting and the influences on it.